Nighthawk Custom of Berryville, Arkansas, is well-known for its custom-built 1911 pistols, and it recently teamed up with Bob Marvel of Marvel Custom Guns to offer 1911 owners a unique .22 conversion unit. Like other conversion units, the Nighthawk .22 conversion unit replaces the stock slide. But unlike some other conversions in which the entire slide reciprocates, Nighthawk's unit is composed of two parts. The upper is made from forged steel and includes the barrel and a full-length rail with a serrated blade front sight and fully adjustable (and dehorned) Elliason rear sight. The upper is positioned securely in the frame by the slide-stop pin and does not move when the pistol is fired. This secure positioning of the barrel greatly enhances potential accuracy, and Nighthawk guarantees one-inch 10-shot groups at 50 yards with specified ammunition. The unit's lower part, or slide, is made from anodized aluminum alloy and contains the firing pin, extractor and a captive recoil spring on a full-length guide rod. It features sharp-edged dual grasping grooves that allow you to retract the slide with wet or oily hands or when wearing gloves. Also included are a slide-stop arm, slide-stop pin and one polymer magazine. The unit will fit on either Government- or Commander-size frames of any centerfire caliber and any holster designed for a five-inch 1911. It should be noted that because of the use of non-standard ejectors, the Nighthawk unit might not work on some Springfield Armory 1911-A1 pistols. To install, unload your 1911, remove the slide and barrel, and then slide the Nighthawk conversion unit onto the frame. Place slide-stop arm onto the frame and align with the pin hole in the frame and notch in the barrel lug. Insert slide-stop pin through the slide stop, frame and barrel lug. Ensure the slide-stop pin head is flush against the slide-stop arm. Retract the slide just enough to expose the hex end of the recoil spring guide rod. Do not lock slide back during installation. Using take-down tool (or 5/32 wrench), tighten the guide rod against the slide-stop pin. Do not over-tighten. In order for the .22 conversion unit to run properly, the guide rod must remain tight. Nighthawk recommends applying a drop of blue Loctite on the recoil rod threads. Check that the slide moves easily and closes completely. I was impressed with the unit's materials, fit and finish. No shortcuts here. My Nighthawk 10-8 .45 caliber pistol served as the original test platform. Installation was quick and more or less fumble-free. My friend Butch Simpson and I headed to the range, where we tested the unit for accuracy from a rest at 25 yards with four different brands of ammo. When you consider that the largest of the 20 groups we fired measured only 1.25 inches in size, it was obvious that the manufacturer's claims about accuracy were not just advertising hype. Early in the accuracy testing the slide failed to go into battery a number of times, forcing us to push it forward with thumb power. A few drops of oil on the pistol's rails solved the problem. To see how the unit would function with other 1911s, we installed the Nighthawk conversion on Butch's Combat Commander and on a borrowed 1950s-vintage 1911A1. Installation was quick, and both guns functioned flawlessly with ammo they liked. We realized that all three guns were having problems with just one load: Federal's light 31-grain, which apparently doesn't produce enough energy to work the blowback-operated unit reliably. Once we figured that out, we spent the rest of the day plinking, running more than 500 rounds through all three guns without a single failure to feed, fire, extract or eject. Magazines were easy to insert and fell free when the release was pressed—loaded or empty, slide forward or locked back. Some shooters might find the 10-round polymer magazine a bit difficult to load to capacity, so Nighthawk includes a simple tool that allow you to depress the magazine follower, greatly easing the process. One other note about the magazine: The slide should be locked back before inserting a loaded magazine into the pistol. We both found Nighthawk's .22 conversion kit a very practical and fun unit. It allows the 1911 owner to engage in extensive target practice without emptying his or her wallet. 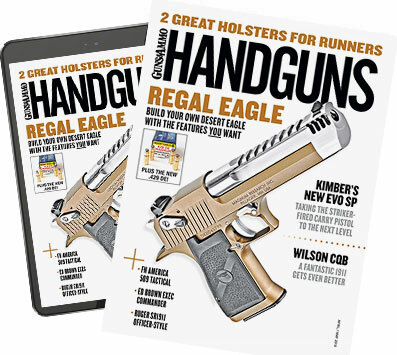 It would be perfect for training new or recoil-shy shooters and, last, turns a large-bore pistol into a practical handgun for small game. Smallest avg. group: 40 gr. Remington High Velocity—0.8 in. Largest avg. group: 40 gr. Winchester Power Point—1.0 in. Avg. of all ammo tested (4 types)—0.9 in. Notes: Test pistol was a Nighthawk Custom 10-8. Accuracy results are averages of five five-shot groups fired from an MTM K-Zone rest at 25 yards.